Back again to Bali with a further life drawing and portrait adventure 13th to 21st 2018. These retreats are always popular and if you are planning to leave from Perth there are currently good bargain airfares available. I mention this as unfortunately I have had to increase the participation cost for future visits but still good value at $1800 per participant and excellent accommodation and studio conditions. We limit numbers to 5 participants so it is a highly personalised experience. For more information go to the ‘Bali Bound’ page on this site. I will be running a two morning workshop for Ellenbrook Arts, on Saturday and Sunday mornings 18/19th November, 9am until 12. It is an interactive program about getting to the next level of life drawing through understanding proportion and how to ‘read’ a pose. Good informative life drawing adventure. Value @ $50. Full up for Bali in October. Hello, we are full up for the October portrait and life drawing visit to Bali. I will be announcing enrolement dates for late March soon. Bali in October, portrait and life drawing. I can’t remember how many Bali Art Groups we have held so I’m guessing it’s about 20! This time its in October and you can find out all of the details by going to the Bali Bound page on this website. It’s reasonably priced, great accommodation and studio, plus a lot of extraordinary Bali experiences with my artist friends and models in Ubud. Limited to just 5 participants, beginner to professional this is a great way to consolidate your talents a get to another level of accomplishment in portrait and life drawing skills. Hoping you can join me. Eastern suburbs life drawing bonanza! 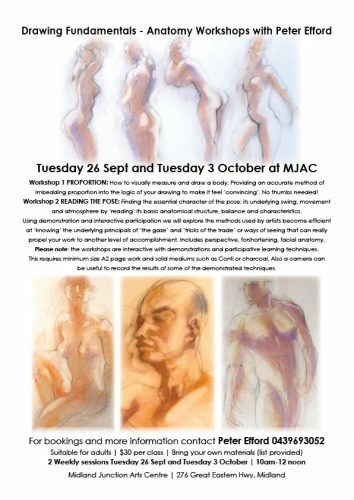 Lots of action for life drawing in the Eastern suburbs these days, There is the Basso group on Mondays, and Carol’s Midvale group on Wednesdays and Thursdays, a couple of Swan Valley groups in action and an Armadale group under way. I have not got all of the details as yet so it you would like to be promoted on my site please send info. Take a look under ‘The Scene’ for current life drawing gig information. Even better ,the Mundaring Arts Centre will be taking over and organising the Midland Junction Arts Centre in the future. There are very positive whispers already in the wind that this will mean the addition of two further weekly Life Drawing gigs available. Please note there will be an Easter Monday gig at at Basso. Only taking 3 persons this time for a wonderful drawing and painting retreat for 8 days. Great to have you along. Great value at $1550! Extra Art Group in Bali 9th to 17th May 2017! We have added an extra visit in May. Nice time of year and a great opportunity to experience 8 full days of studio painting, drawing, portraits, life drawing and some landscape. Reasonably priced and great accommodation. Take a look at tab, Bali Bound on this website for more details. One place left for Bali in February! We have had a cancellation for our Bali life drawing and portrait visit departing 6th February returning 16th. 2017. Take a look at the Bali Bound heading on this home page. More information and great pics.